C.W. asked me for an hour or so of his time interrupted so I knew he was in serious mode. 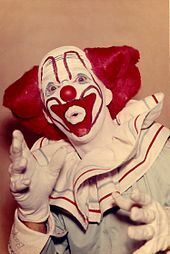 Imagine my surprise when he showed up as Bozo The Clown. That caused me to think. While I did so, he continued. He scrolled a bit, with great ceremony. “An actor playing the role of a crazed gunman who may or may not have known the role was terminal.” He looked at me and raised one of his huge eyebrows, then continued.